When we are hired by business owners to act as their business coach, we focus on their marketing, their sales, their human resources and various other parts of how they run their business. We tell them that we want to be brought in on any decision they make that has to do with our areas of expertise. What they have done, by hiring us, is to spin the prize wheel where every slot is a winner. One of our clients forgot to talk to us about a trade show, so of course, I have to write about it. You see, I (Hank) am an expert on trade shows, having exhibited at well into the triple digits and when you include the number of businesses I have prepared clients for trade shows, it’s up into four digits. Our client was exhibiting at a trade show and used a prize wheel with 18 different slots. That’s a great thing, but they did not check with us before they put the prizes on that prize wheel. They gave away gift cards that had nothing to do with bringing people back to their business. Instead, they gave away about $500 to OTHER companies. That was a large percentage of what they invested for us to work together and we could have had them invest it more wisely. What should they have done on their prize wheel? We recently did a business expo for a local group of chambers of commerce. We used a prize wheel with that same 18 slots. All of the slots in this prize wheel brought people back to our business. When someone won one book, we surprised them by sending BOTH books. That’s because we wanted to give them something they did not expect. head start. We ALSO told them that if they wanted an even bigger head start, they should sign up for a Free Marketing Consultation and we will get them focused. a book, too. We also added the Free Marketing Consultation. Surely it was going to cost us a lot of money, right? That is not true. The e-books now have only fixed costs that are long since paid. The Small Business Breakthrough Bootcamp has fixed costs so adding a few more people does not cost us anything. In fact, it lowers our average cost person attending. The $1,000 off our private coaching program DOES lower our cost, but when you refer us someone that becomes a private coaching client, you earn $1,000 so we were just, in effect, paying ourselves the $1,000. Compare the slots in our prize wheel to the slots of our client who forgot to check with us and he gave away coupons to coffee stores. His has fixed hard costs that will never be absorbed and offset by other sales. The people spun, won a card, and went on their way. He could have offered to buy them coffee and solve their challenges (his business) over coffee…. When you are exhibiting at a trade show and are looking for cool ideas that will generate more revenue from your trade show investment, let’s have a chat. Because whether it is a prize wheel, a drawing or some other ideas to get trade show attendees to cross the invisible line and talk to you, we are here to advise you. 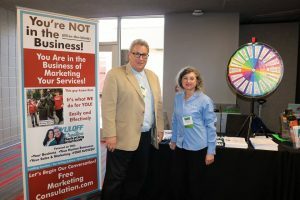 For your free marketing consultation head to www.FreeMarketingConsultation.com and we will get you focused for your next trade show or everything else in your business. 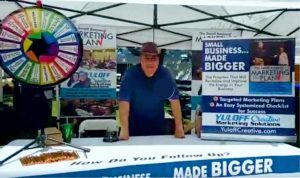 When you go to FreeMarketingConsultation.com you are spinning the prize wheel and are a guaranteed winner. Hank originally wrote this post a few months before Sharyn scheduled it for publishing for multiple reasons. 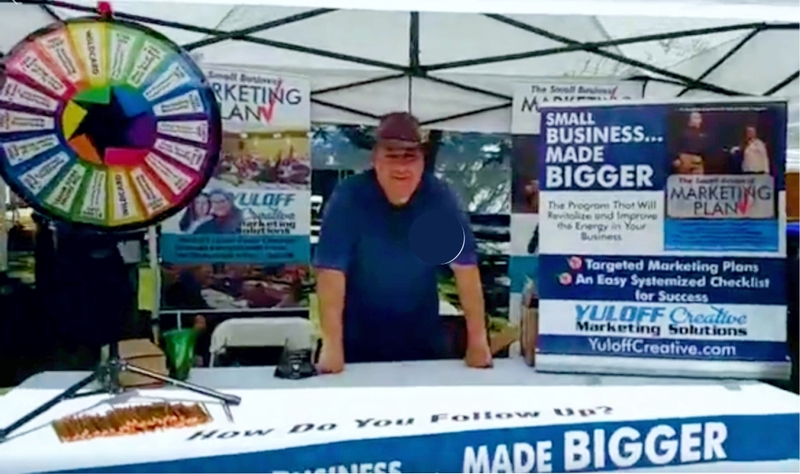 Since Hank originally wrote it, we have recently exhibited again using the same prize wheel and talked about it on our radio show, The Marketing Checklist.